A little pigeon sets out on a global journey to spread a message of peace and friendship in a stunning reimagining of John Lennon’s classic lyrics of hope for a brighter future. According to his wife, Yoko Ono, Imagine was written ‘as a song calling for peace around the world.’ As such, it makes the perfect backdrop for a touching visual narrative by artist Jean Julienne as a humble pigeon takes flight to journey across many lands bringing a message of hope. 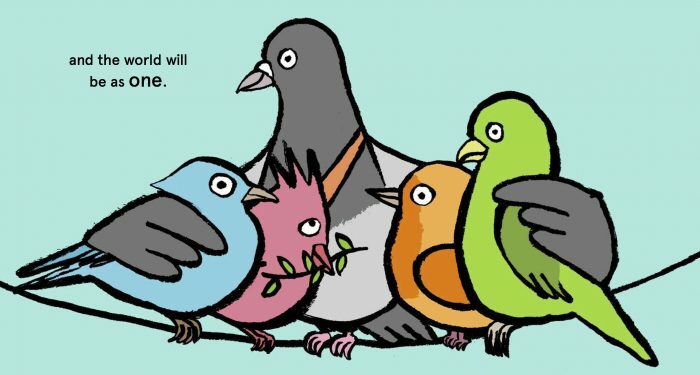 Carrying an olive branch symbolising hope in its beak, the pigeon takes flight across a cityscape before meeting a colourful array of birds of all sizes, shapes and colours in a peaceful and happy embrace. 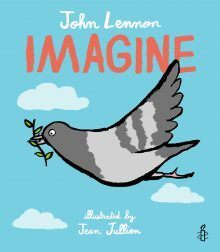 The deceptively simple graphic images, with thick black outlines and a sumptuous palette of turquoise and peachy tones, have a child-like charm that bring Lennon’s immortal lyrics to life for children and parents alike. For fun activities, including making your own Imagine bunting or writing your own message of peace, visit the Amnesty website. John Lennon, the great rock ‘n roll rebel and iconoclast, started his singing career as a choir boy at St. Peter’s church and was a member of the 3rd Allerton Boy Scout troop. John Lennon was a founding member of The Beatles and went on to have a successful solo career after they disbanded. Imagine, which he composed in one session sitting at his piano, has become a worldwide anthem of unity and hope. To learn more, visit www.johnlennon.com. Originally from Nantes, Jean Jullien is a London-based illustrator and graphic artist, who works with a vast range of media, including illustration, photography, installations and clothing. He graduated from Central Saint Martins in 2008 and from the Royal College of Art in 2010. 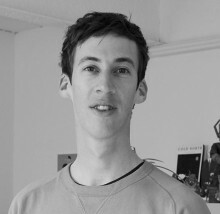 In 2011, he founded Jullien Brothers, specialising in moving image. 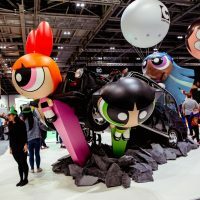 His clients include Waterstones, The New York Times, Tate, Channel 4, Byron Burger and the Guardian; he also regularly exhibits his work in France and London. He lives in East London.